k.t. has been at various times in her “grown-up life” been a community organizer, anti-hunger advocate, private childcare provider, candidate for elected office, and preschool teacher. Occasionally, she has been several of those things at once. 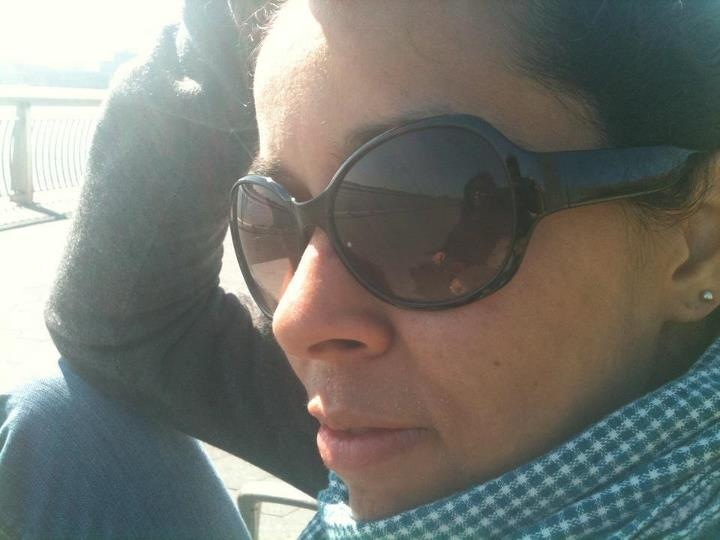 A native New Yorker, k.t. believes in the power of the American short story, the laughter of children, and that home is the place in which you are your best self. Nola Studiola: Do you have a physical space and routine that helps you create? How has your creating schedule (time of day, whether you need to be naked, talismans, etc.) changed over the course of your career? Also: would you rather have the ability to be invisible, or the ability to fly? And, do you have an amulet/talisman? I know this is actually 4 questions in one. Pick what you want to talk about and see what happens. Do you have a physical space and routine that helps you create? How has your creating schedule (time of day, whether you need to be naked, talismans, etc.) changed over the course of your career? Also: would you rather have the ability to be invisible, or the ability to fly? And, do you have an amulet/talisman? Last week, when I first started thinking about my possible answers to these questions, I had a fairly good sense of where I would start. Re: physical space and routines, I was going to tell the story of my kitchen table, a generous gift from the parents of one of my oldest and dearest friends, when they sold their summer house on the Cape a couple of summers ago. It was exactly the kind of table I’d been looking for for years–with folding wings on either side-and just compact enough to fit in the corner of my New York City apartment labeled “dining area.” Its placement near the window that overlooks the community garden next door & a view of the Empire State Building, along with the sense of history and connection to a family that I have known since my first year in college, means that not only is it my dining table, but, it has also become my favorite place to work. In preparing to compose my response, I imagined myself sitting at my table, early Tuesday morning, sipping my first or third cup of coffee from my French Press, and typing away. And, then I come home close to midnight on Monday night, after a 14 hour shift with the “Babies of the World” and a glass of wine at “the bar on my block,” and found my kitchen ceiling on top of my stove. And, in my sink. And, on my kitchen floor. Without any visible leaks from my upstairs neighbor’s apartment, and not feeling like I should (or could, since I think I was in shock, really) call my building’s super at midnight, I brushed my teeth, changed out of the clothes that were covered in pasta sauce & sunscreen (remnants of the day’s adventures with toddlers), and went to bed. It was going to be an early Tuesday morning. And, there would be nothing routine about it. It wasn’t until Wednesday morning that someone was able to come in and tear down the rest of what continued to crumble. 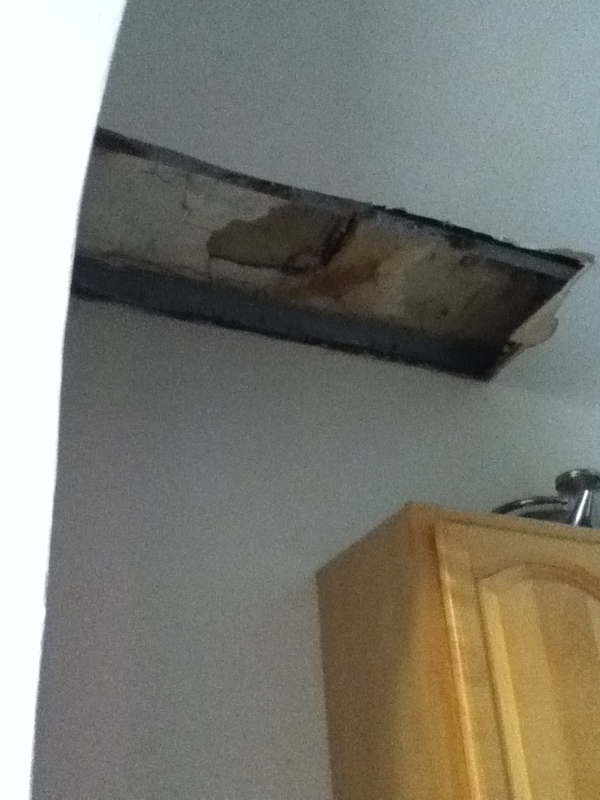 And, though, I was still left with a hole in the kitchen ceiling, at least it was a more manageable hole (yes, it does turn out that one can have a “more manageable hole” in one’s kitchen ceiling). But, the kitchen is still unusable, as there is still the occasional detritus meeting its fate with gravity; and, many of my kitchen supplies have been relocated to the top of my dining table. 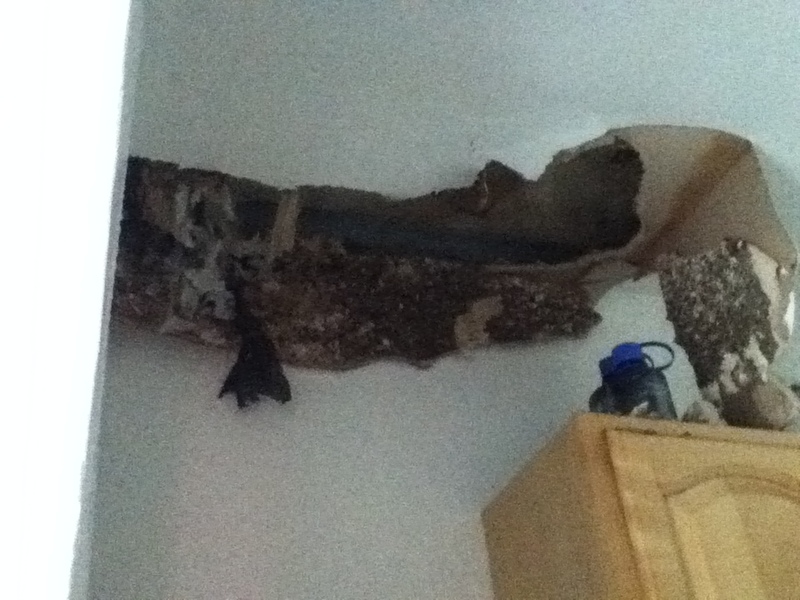 And, so, I have spent the better part of this week, negotiating life with a hole in the kitchen ceiling. Without my kitchen. Without the ability to make coffee and sit with it at my table, typing away and contemplating the view. I have spent the better part of the week without a physical space in which I feel either safe or comfortable. Nor with the possibility to latch onto one of my treasured routines to make it through. But, here I am anyway, typing away — sitting at the edge of my bed, while contractors finally endeavor to patch my ceiling. And, so, today’s answer — the one that I never would have imagined when the question was first proposed a week or so ago — is that physical spaces and routines that enable creation are really just functions of the limits and constructs that we place on ourselves (i.e., how many times have we heard people say that they can only be productive when they’re working in a coffee shop? Really?). Yes, there are places that are more comfortable. There are routines that make things easier (because, well, we’ve trained ourselves in those routines). But, really, what I think I’ve learned this week is that the most important physical space I need for creation is the space I make within my own brain, after clearing out all the noise of the day, and the only routine I need to commit to is to “just start.” Anywhere. With whatever I have. Under whatever circumstances I may find myself. Because the space & the routine are just things. But, the creation, well, that’s EVERYTHING. 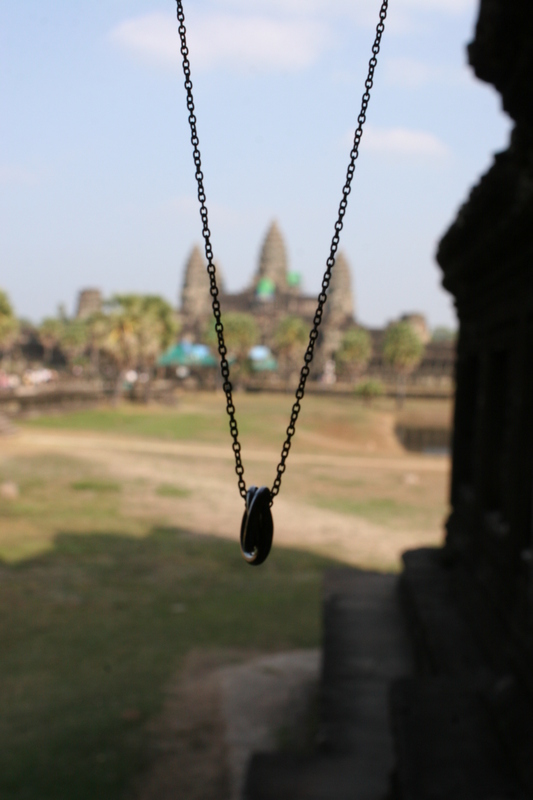 caption: I found myself, alone, at Angkor Wat on Christmas Day 2011. I wanted a record of my presence there; but, hate having my picture taken & was enjoying having a solitary experience at one of the world’s most sacred and beautiful sites. And, so, I stripped off my necklace, a gift to myself during a particularly challenging time a year earlier & a constant reminder of self care, and took this self-portrait. Days when I am without my necklace are days when I feel most vulnerable. A few weeks ago, it was put away for safe keeping, as the clasp was broken & I did not want to wear it and possibly lose it before it could be repaired. I had secured it so well, though, that this week, as I struggled with collapsed ceilings and feelings of displacement within my own home, I was unable to find it. Perhaps just coincidence. But, I am starting to think that, really, the universe was having some fun with me this week. If we go with the dictionary definition of amulet: “a small object worn to ward off evil, harm, or illness or to bring good fortune,” I think this is it. And, I’ll be getting it repaired within the next couple of days. caption: The ability to fly, despite my ever present fear of falling. Always the ability to fly. 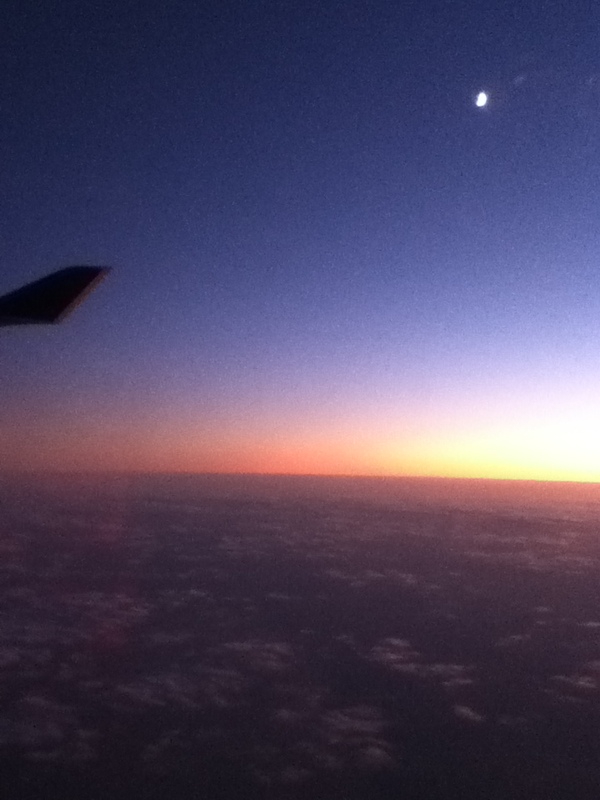 Photo taken en route to PNH, somewhere over the Persian Gulf; August 2011. AB: Thank you for providing the perfect finale to the summertime Nola Studiola. I wish you and all Studiola readers new adventures in creating as August grinds toward autumn. A new version of the Studiola may re-emerge in the fall (a collaborative curatorial structure is currently in the Marination Tank) and it is then we’ll hear from Martha Rose Shulman, the restaurants Cochon, and Arcane. Till then, here’s to creating your own Studiolas, whether they be made of mind, heart, drywall, or a little of all three. Thanks James! It’s been a good run.